Captured angels, bioterrorism, chimpanzee politics, and tips on staging your own death. These are but some of the strange tales to be found in this book. 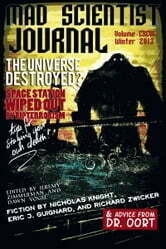 Mad Scientist Journal: Winter 2013 collects three months worth of essays from the fictional worlds of mad science. 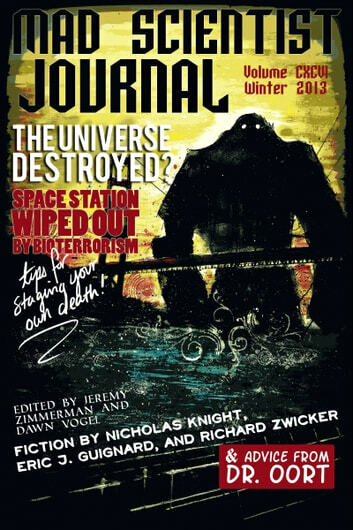 Included are three new pieces of fiction written for the discerning mad scientist readers written by Eric J. Guignard, Richard Zwicker, and Nicholas Knight. Readers will also find other resources for the budding mad scientist, including an advice column and other brief messages from mad scientists. Authors featured in this volume also include A.W. Gifford, Nicholas P. Oakley, Franz Bidinger III, David Taub Bancroft, Cameron Suey, Mark Wardecker, Mark Carpenter, Antoinette McCormick, Alexis A. Hunter, Kate Elizabeth, James Rowland, Conor Powers-Smith, Sean Frost, Jesse Heindl, Pôl Jackson, Andi Blija, Andy Brown, Jeremiah Cheney, Mike Dominguez, and Parker Mackenzie. Illustrations are provided by Justine McGreevy, Katie Nyborg, Eleanor Leonne Bennett, Cory Caywood, Scarlett O'Hairdye, and Luke Spooner.